As quoted of Autoevolution, a four-wheeled mobility scooter works of two mechanics of the Isle of Man, David Anderson and Mathew Hine managed to break the Guinness World Records. Their Vehicle managed to sped away with the fastest speed of 107.6 mph (173.13 kph) in a record-breaking event in the Jurby Motodrome circuit, Isle of Man. The scooter was speeding as far as a quarter-mile (402 meters) in that time. Of course, the world's fastest four-wheeled scooter was not in standard conditions. David and Mathew have modified the original 'Days Strider' four-wheeled mobility scooter by adding the Go-Kart redesigned framework. While its drivetrain been modified using an engine belonging to a Suzuki Bandit sport bike. The standard body had to be redesigned to match the new engine as well as adapted to the sitting position and the scooter rider hands while riding. To change the scooter, both take up to six months. 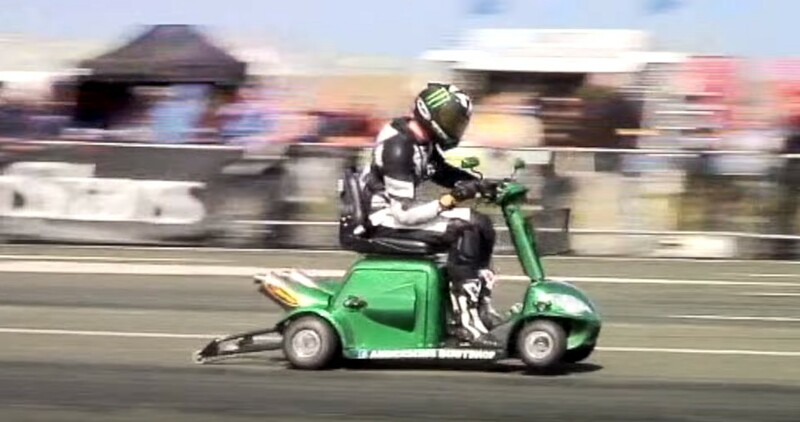 Although successfully listed as the fastest in the world, but their custom built scooters can not be used on the street because it does not meet the applicable standards. Because of the tiny scooter is not equipped with front brakes.